Wheel sizes can seem confusing, use the basic guide below to take the mystery away from selecting the right alloy wheels for your car. We should start by saying that the tyre and wheel industry has had trouble adapting to the metric world with most wheel and tyre sizes still described in imperial or inch measurements. For those born into the metric world, 1” is the equivalent to 2.54mm. However, other wheel measurements are described in millimetres such as wheel offsets and wheel stud pitch circle diameters. 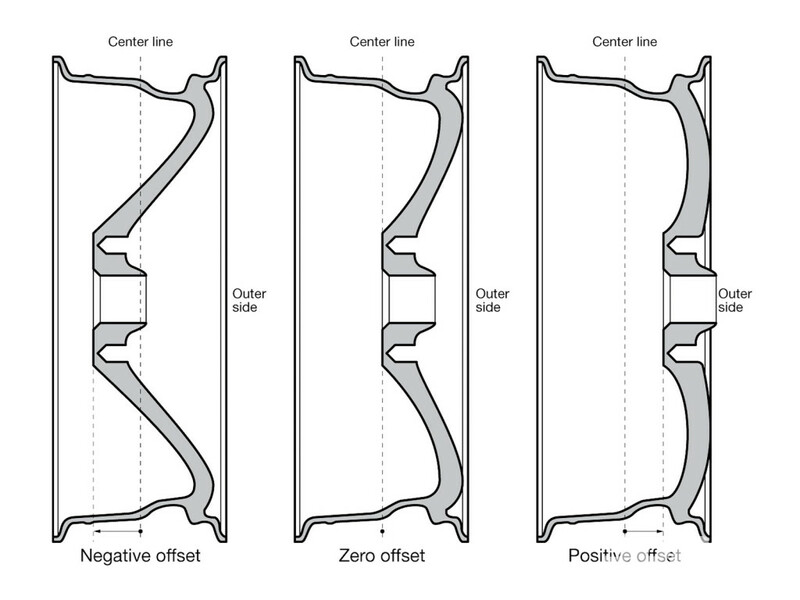 Note positive and negative offset. The width and diameter of a wheel are fairly easy to understand although, note that these are not used to describe the overall dimensions of the wheel. These sizes describe the measurement from where the tyre bead sits. So an 18” diameter wheel may measure 19” in diameter from edge to edge, but 18” in diameter if measured from the tyre mounting surface. 12”, 13”, 14”, 15”, 16”, 17”, 18”, 19”, 20”, 22”, 24” etc. Typical wheel widths are 5”- 10” although some racing rims can be up to 15” wide. The Offset of a wheel is usually measured from the centre line of the wheel up to the flat face that mounts against the axle or brakes. Deep dish wheels that stick out wider and need wheel arch mods will have a greater negative offset. Wheels that are widened towards the inside of the wheel arch and closer to the suspension will have a greater positive offset. This measurement is important as it dictates wheel well clearance and suspension clearance. It can also affect the tyre and wheels ability to return the steering to straight ahead making the steering wheel heavier or lighter. The wheel offset measurement is often described as its ET. 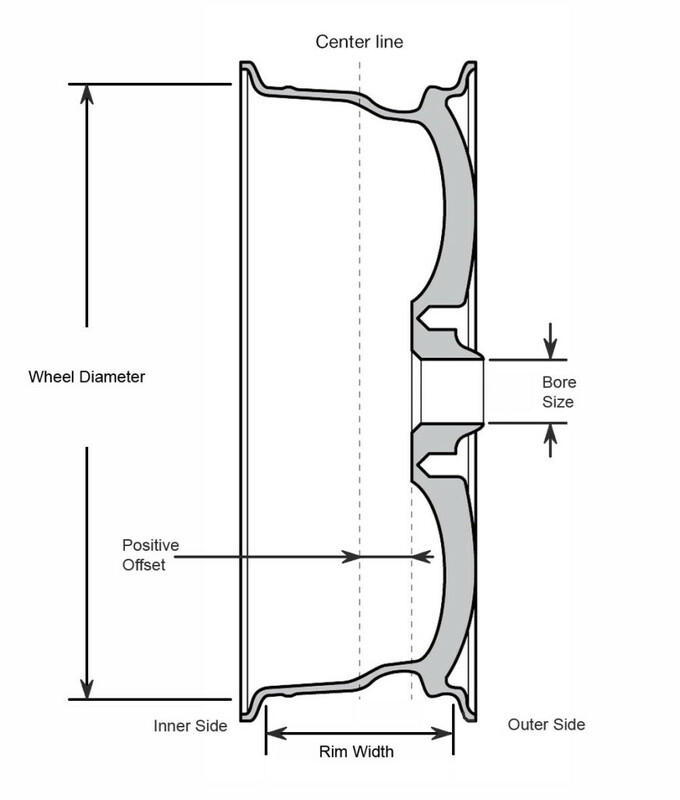 Pitch Circle Diameter describes the bolt pattern where the wheel mounts to the car. Cars can have as few as 3 bolts to mount the wheel or as many as 10 bolts on some trucks. The diameter measurement is the diameter of a circle drawn through the centre of your wheel studs or bolts. 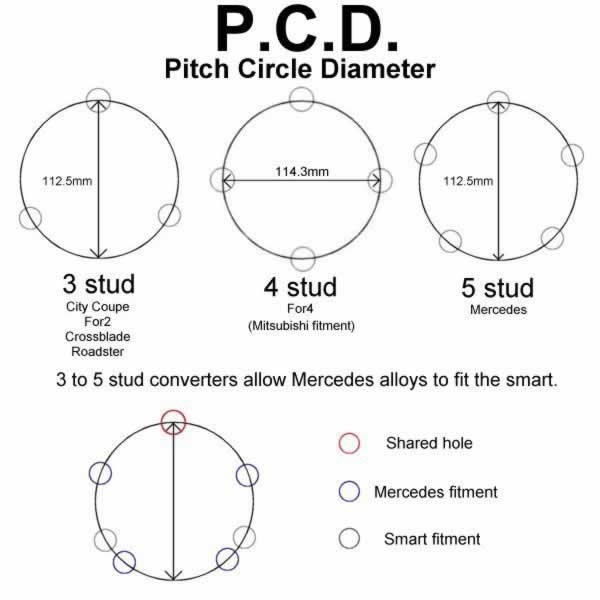 The most common fitment has 4 studs and a PCD of 100mm, and is commonly described as 4×100.